Joined Haven last season from 2007 NL2 Championship winning side Featherstone Rovers. In 2002, Ade, a promising schoolboy athlete and footballer joined the London Broncos development programme before signing up for their junior academy team the following season. In 2004, as well as representing the BARLA Young Lions against France, he also made his debut for London in Super League. Limited opportunities at senior level led to a spell on loan to Hull FC where he played in their successful 2005 academy side. His association with the London club ended in 2007, when he signed initially for Doncaster before moving to Featherstone for the last 11 games of the season. 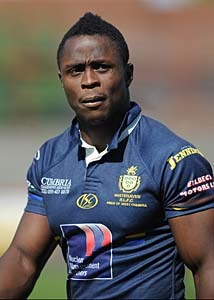 His first year at the Recre was a great success and he finished the season as the clubâ€™s top try scorer. Together with teammate Craig Calvert, Haven have two of the most potent wingmen in the Championship.